Two of Toronto’s most progressive priests meet for the first time. The meeting was my doing. Fr. Roberto Ubertino is a practical priest whose good works underpin his faith. He runs the St. John the Compassionate Mission — it is Carpatho-Russian Orthodox — on Broadview near Queen. He feeds the poor, opens his doors for an out-of-the-cold program, and offers regular mass; the miracle, for me, is the business end of the operation. St. John’s Bakery provides jobs with good wages and benefits for some 30 people who might otherwise be on welfare. Fr. Hernan Astudillo is also a practical priest. He serves the Latino community from the Anglican Church of San Lorenzo, on Dufferin St. south of Lawrence. Hernan and his congregation have built a community centre, and a Spanish-language community radio station; every year they send cash, food, tools, clothing, as well as used school buses and used ambulances, to El Salvador and other countries in Central America. The two priests do similar work, but they had never met, so I made the introductions. 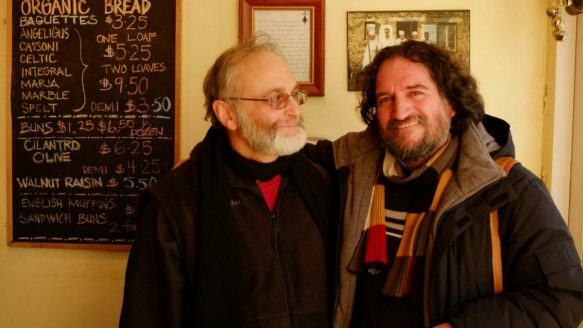 And Roberto invited Hernan to lunch at the Mission — a bowl of vegetable soup, superior when brightened with a bit of salt, and also some of that bread. Roberto began by asking Hernan about his work. Hernan said, “We started 12 years ago, at the moment when there were two earthquakes in El Salvador.” There are many Salvadorans in his tiny parish; everyone knew the extent of the disaster. If that sounds simple, it is. To date, Hernan’s parish has also sent 48 used school buses and 30 ambulances to Central America, and a lot more money raised from the sale of rice and beans. It is, as far as I know, Canada’s only Latino community radio station. They outgrew that place, and were forced to move; for a time Roberto and his volunteers did outreach from park benches. Eventually, the place on Broadview — it had once been a Pentecostal church — opened up. And what of the bakery? Thirty people now work there, earning decent, competitive wages; they make 3,000 loaves a shift, and they support themselves, and they pay taxes. Also, the bread is very fine. After lunch, Roberto showed his new friend around. Hernan’s eyes lit up at the sight of the oven. It is a massive Italian beauty, custom-built. I expect these two to cook something up together. Poet, publisher, and former banker Raymond Souster is shown at the Old Mill Bridge on the Humber River in Lambton Park in October 2000. Souster died earlier this year. Russ Loader of Oshawa is shown preparing to light a bulb from the current under his bedroom floor. Father Roberto Ubertino, seated centre, at St. John the Compassionate mission on Broadview Ave. surrounded by volunteers and friends. Father Hernan Astudillo is shown in front of the Church of San Lorenzo, on Dufferin St., south of Lawrence Ave. W.
Let us offer best wishes for the year ahead to some of the people who have appeared in this space over the past 12 months. Happy New Year to my two favourite priests, Father Hernan Astudillo of the Church of San Lorenzo, and to Father Roberto Ubertino, of St. John The Compassionate Mission. Father Hernan and his parish have raised thousands of dollars in aid and supplies, including ambulances and buses, for those who have been harmed by earthquakes in Central America. This year, among other things, the padre worked as a field hand in the Niagara region, in order to better understand the migrant workers for whom he says mass. Father Roberto? He runs the mission on Broadview north of Queen. You may also know the St. John’s Bakery, which makes some of the best sourdough bread in the city; more importantly, it employs a dozen or so people who would otherwise be on welfare or collecting benefits; instead, they are paying taxes. I am not, by nature, a religious guy, but these two are an example of faith through good works. I now want to wish a happy new year to Nick Lounsbury, who helped to rescue a man who jumped in front of a subway train last spring. I send best wishes to Russ Loader of Oshawa, who discovered that there was so much electrical current coursing under the floors of his apartment that he could power a light bulb, simply by touching bare wires to the floor. No one but me, and Dr. Magda Havas of Trent University, seems to think this is a serious problem. Best of the season to you, too, Dr. Havas. Tashi delek and happy New Year to Pema Choden, who fed me the best momos I have ever eaten. Now here is a Raymond Souster story. The poet died earlier this year. The last time I saw him, he gave me an armload of his books. I opened one of them recently. It was an orphan; the pages were blank. If I had any nerve at all, I would hand-write some of my own poems between the covers. I wonder why the Canadian Imperial Bank of Commerce does not erect a statue of the banker-poet in the courtyard in front of their head office downtown. Happy New Year to John West, who dominates the ping-pong tables at the Wellesley Community Centre; also to his happy foil, the recreationist Lucky Boothe. We are the ones who are lucky. Nathaniel Banton? We love that man around here. We also send our love to Donald and Alane Simmonds, who mourn the loss of their son Kevin. Greetings, and thanks, to the person at Toronto Community Housing who arranged for the cover over the canopy at the entrance to 200 Wellesley. Best wishes to Frank DiGenova, of Butcher By Nature on Annette St. Frank is back in business after the fire. Happy thoughts to my other favourite butcher, Peter Sanagan, of Sanagan’s Meat Locker in Kensington Market, who recently expanded. These two should also meet. And now to Bob Richardson and Bertie Nakogee. Bertie was a First Nations volunteer who died in Toronto before he could serve overseas in the First World War. He was buried in an unmarked grave. Bob secured him a tombstone. But my kindest thoughts are for you, dear reader, for following me around town the past 12 months. The men and women who sleep in the shelters of our city, on slender mattresses and under thin sheets, are turned out onto the streets at 6 a.m. I have been told that this allows time for the shelters to be cleaned. Oh. I see. We may therefore remain untroubled by the sight of a man or woman on a grate in the early hours, secure in the knowledge that somewhere a mattress is being turned, and sheets are being washed. But there is one good true thing which rises above the institutional cruelty of the day: the winter breakfast program at St. John the Compassionate, on Broadview a few steps north of Queen, has just started up for the winter; doors open, no surprise, at 6 a.m. The coffee had been brewed and the smell of it filled the air when I arrived; there were doughnuts on a table, the eggs awaited scrambling, and the frying pans were hot and ready for dollops of pancake batter. As the men and women came in from the cold with their backpacks, Joanna Dunn watched over them, and while she did she gave me a history lesson. You put that sort of question to her and you know you’ll get results. Joanna said, “It started with coffee and a warm place to be. I don’t cook. But we got funding, and the Father got people cooking from the parish.” The mission now serves 70 breakfasts every day, Monday to Friday, and the place was packed by 7 a.m.
Jilly’s is a peeler bar in a handsome old building on Queen at Broadview; rooms for rent on the upper floors. They were keeping track of the number of guests, but they did not bother to tally the cat from the house next door who wandered in to rub up against the legs of the people having breakfast, nice kitty, there’s a good kitty. And by the time the libraries and the drop-ins were opening down the street, the kitchen staff had scrambled seven cartons of eggs, 18 eggs to a carton; they had turned two big boxes of mix into pancakes; and the hungry men and women had washed down the doughnuts and bagels with a dozen litres of milk and 125 cups of coffee; get it while it’s hot.